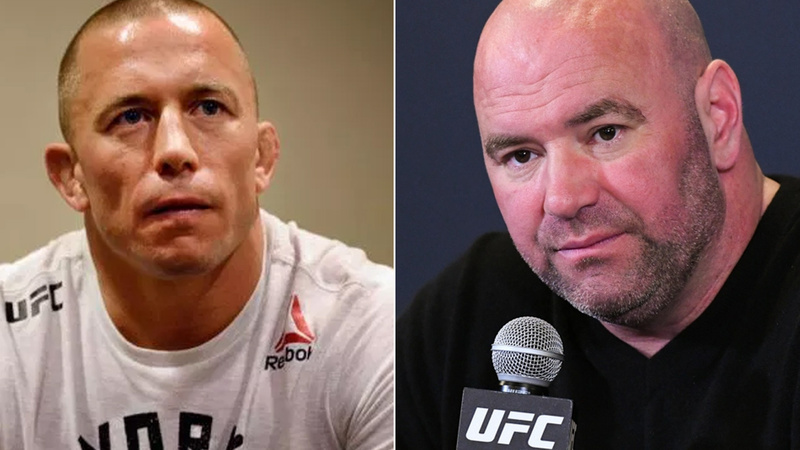 UFC president Dana White isn’t interested in the idea of former welterweight champion Georges St-Pierre taking on the winner of Conor McGregor vs. Khabib Nurmagomedov. Undefeated Russian Khabib Nurmagomedov will defend his undisputed lightweight title when he clashes with former two-division champion Conor McGregor in the main headline of UFC 229 in Las Vegas on Oct. 6. St-Pierre returned from four-years of hiatus at UFC 217 back in November where he submitted Michael Bisping to win the middleweight title. St-Pierre assured Dana White that he would defend the strap if he emerged victorious, shortly after winning it St-Pierre relinquished the title citing ulcerative colitis and hasn’t fought since then. Georges St-Pierre is improving and expressed his interest in challenging the winner of Khabib vs. Mcgregor, that fight will give him a chance to win the title in third weight class as well boost overall legacy. White understands what Georges St-Pierre is looking, as he doesn’t blame him entirely for that. St-Pierre dominant the welterweight division for a long time, defeated all-comers, but now he self-imposing a career at age 40, so he wants fights that give something to his legacy. St-Pierre also turned down the Nate Diaz fight, as former champion feels Diaz doesn’t fit in the bill for solidifying his status in the UFC. When St-Pierre and Michael Bisping bout negotiation hit a rough patch, White doubts that former champ really wants to fight. Dana White is still unsure that he’ll ever return to the Octagon again. UFC always seems to struggle to get St-Pierre back to Octagon. Promotion is offering some great PPV cards by this fall and GSP has a chance to return to either one, but UFC and St-Pierre need to work together on fight deal. If GSP intends to make a comeback at UFC 231, which he seems to be bit interested during his interview at submission radio, then White is happy to welcome him back in Octagon.